Imaging techniques play a pivotal role in the diagnosis, follow-up, and management of aortic aneurysms. 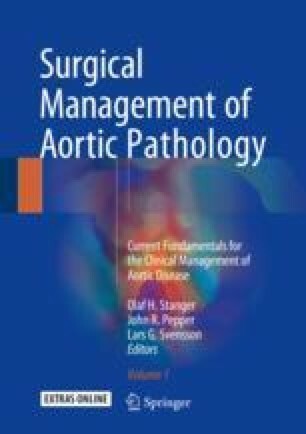 Ultrasound, computed tomography (CT), and magnetic resonance imaging (MRI) have strengths and limitations in the assessment of this disease depending on the aorta segment involved, the reason of the study (diagnosis, follow-up, or surgical indication), and characteristics of the patients. Ultrasound, transthoracic or abdominal, is very useful in the diagnosis and follow-up of proximal ascending aorta and abdominal aorta aneurysms. However, other imaging modalities may be required to confirm measurements and add information on adjacent structures or involvement of aortic branches. Transoesophageal echocardiography (TOE) is frequently limited for perioperative indications. CT has the advantage of providing optimum morphological information on the entire aorta and the accuracy of size measurements, and MRI offers good morphological and dynamic information on the aorta without radiation, although in clinical practice its availability is lower. Additionally, MRI can provide functional data, including quantification of forward and reverse aortic flow, assessment of aortic wall stiffness/compliance, and analysis of 4D flow and wall share stress. However, CT aortography remains one of the most frequently used imaging techniques for the diagnosis and follow-up of aortic conditions in acute as well as chronic presentations. Advantages of CT over other imaging modalities include rapid image acquisition, multiplanar capacity with submillimetric spatial resolution, and its availability. The main limitation of CT is radiation exposure and the need for nephrotoxic contrast administration. Although CT is the most used imaging technique in the diagnosis of acute aortic syndrome, TTE offers crucial information on aortic regurgitation severity and causes, left ventricular function, and pericardial effusion/tamponade. Better understanding of imaging modalities may improve the management of this disease. In addition, new biomechanical and metabolic information could potentially provide more reliable predictors of aortic disease complications.